Here at A Day Like No Other, we are used to being asked all sorts of questions about any wedding detail imaginable. One regularly recurring question, however, is in regard to appropriate gifts for bridesmaids. Given that etiquette demands a lot from bridesmaids – from planning a bridal shower to paying for their travel to the wedding, accommodation and attire themselves – our brides feel that a special gift to these special ladies is in order. It should be beautiful, personal, meaningful; it should be worn for the wedding day, but also beyond. Some brides gift their bridesmaids the dress they are supposed to wear at the wedding ceremony, some gift a robe and hair/makeup services. I personally have always been a fan of giving a piece of beautiful jewelry that can be worn way beyond wedding day. And now I’ve finally come across the perfect choice! It is a personalized necklace from brevity with the name of the recipient rendered in a variety of materials and at different price points – something for every taste and for every budget. Founder and lead designer Anna Corpron is most definitely up to something here! 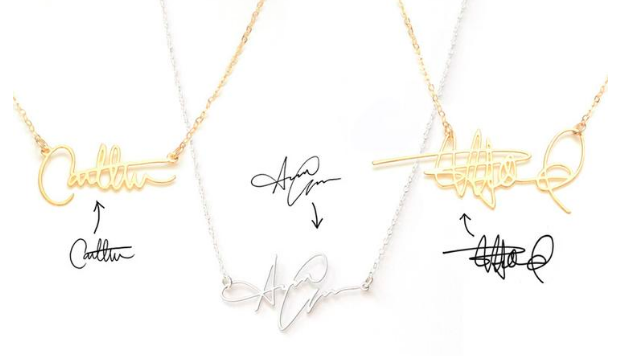 You can have individual signatures translated into necklaces – just email them a photo of the signature, and they’ll do it! Or you can have the name of the intended wearer hand-calligraphed (they have a calligrapher on staff who is doing nothing else!) in a modern, flowy style. 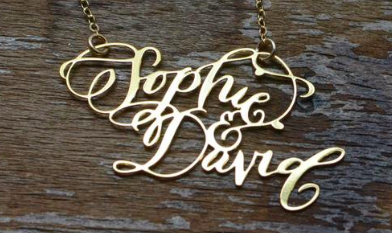 You can even combine two names in one piece (I would say that’s the perfect bride-and-groom version!) for an impressive statement piece. All these pretty pieces come in steel, pure or gold-dipped (the most affordable versions) or in sterling silver or in solid gold… so, which one is your favorite? As I said – something for everyone! Actually, YES. Also for celebrities! Kylie Jenner, Francesca Eastman and Malin Akerman, to name just a few, have been spotted wearing their names or signatures as jewelry courtesy of brevity. And the best thing is… our brides at A Day Like No Other even get a discount! So – what are you waiting for?